Custom Garage Doors by Clopay & Amarr Doors. Online Design Tool! Want Custom Garage Doors For Your Home? We specialize in design and installation of custom garage doors by Amarr and Clopay. Not every home has garage door openings that will accept a standard-sized door, so the construction and installation of custom garage doors are required. 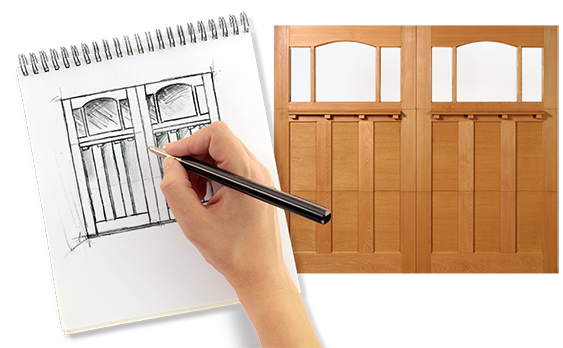 Or custom doors may be what you need to get that unique look that perfectly complements your home's decorative style. If so, we can help you can your own, just call 281-252-3346. Aladdin Garage Doors Houston is a full service garage door sales, installation, and repair company serving Houston and surrounding areas. We specialize in the sales and installation of standard as well as custom fit and finish garage doors. From taking proper measurements to helping you select your styling and finishing choices, our team of garage door experts ensures you get the look and convenient, modern overhead door operations you want. No matter the architectural styling of your home, your new custom garage door solution will enhance the design and value of your home. 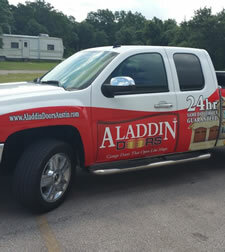 When you choose Aladdin Garage Doors Houston you’re partnering with a small, local, family run company. Our local business is large enough to serve your garage door services needs 24/7/365, but we’re still small enough to treat you as if you were our only customer and make sure you’re 110% satisfied with our services. Whether you'd like to have some beautiful faux wood garage doors with custom hardware or you'd just like something to match the architectural style of your home we'd be happy to provide you with an estimate. For a free estimate to have custom garage doors installed on your home call 281-252-3346 or fill out our contact form. Someone will get right back to you.